Bathing outdoors amongst lush gardens and flowers will leave you feeling revitalized and refreshed. 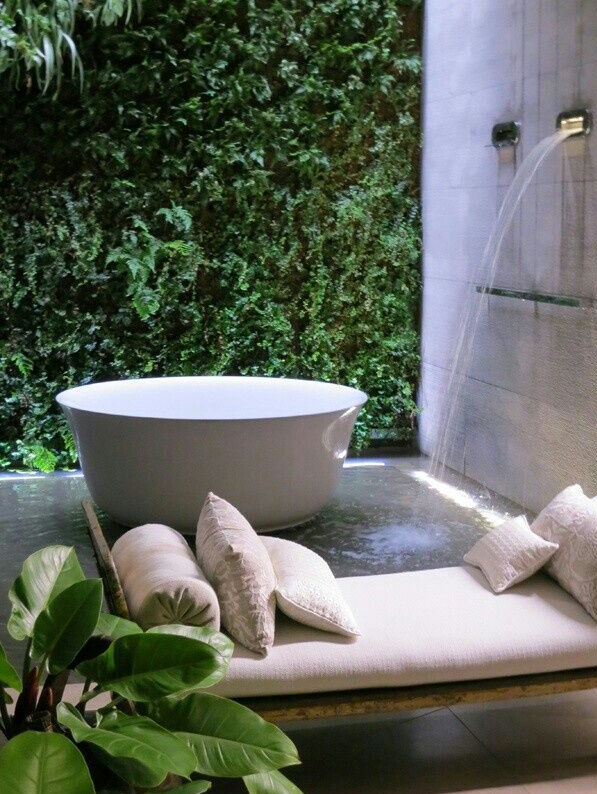 Whether you’re rinsing off from a dip in the ocean or your swimming pool, or making a step towards reconnecting with nature, an outdoor shower will invigorate your cleansing ritual. Imagine stepping into a heavenly oasis, right in your backyard. A private retreat amongst tropical greenery, climbing vines, and tall grass. Build walls of smooth stones, tile mosaics, and let the moss grow like layers of lace. Whether you invest in a designer to construct a luxurious addition to your outdoor space, or use your own creative ingenuity for a DIY style project of transformation, the most important thing is to feel the lavishness of life and nature in your own home. Here are some of our favorite selections of exquisitely inspiring outdoor bathrooms, we hope you enjoy!